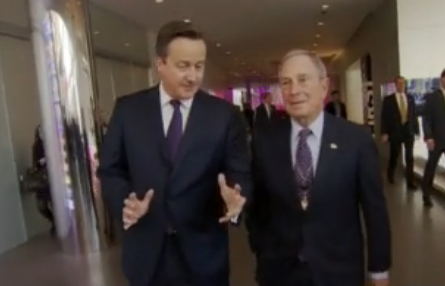 UK Prime Minister David Cameron was apparently caught off-guard today by a camera crew as he spoke to New York Mayor Michael Bloomberg about his feelings on the Scottish referendum and the Queen’s unusual reaction to the news Scotland had voted to stay in the UK. Although the Prime Minister wasn’t wearing a microphone at the time, the comments were picked up by a Sky News camera crew as he said: “The definition of relief is being the Prime Minister of the United Kingdom and ringing the Queen and saying ‘It’s alright, it’s okay’. That was something. “She purred down the line”. Sky News reports: “Buckingham Palace would neither confirm nor deny whether the Queen purrs when she is happy”. Cameron then spoke about his anguish at the thought Scotland might leave after a disastrous poll in the last week of campaigning that put the separatist movement slightly ahead. He said: “I’ve said I want to find these polling companies and I want to sue them for my stomach ulcers because of what they put me through”.